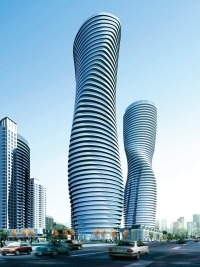 As many of you may know, the design of the curvaceous Absolute World Condos aka "Marilyn Monroe" buildings in the Mississauga core next to Square One was as a result of an international design competition where Yansong Ma of MAD Architects ultimately won. Several years later I thought it might be interesting to check on what didn't win and how Mississauga could've looked. I've left off the buildings that are pretty much just regular buildings, that wouldn't have been memorable or iconic at all, and certainly wouldn't have been considered landmarks. The ones I have included I have to admit, are a little weird. 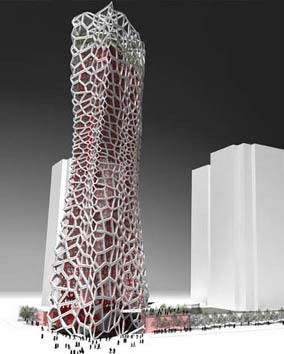 This one is as if aliens have invaded, took over a building and are making all sorts of weird technology inside of it. It certainly would've been iconic, but would've people also been too scared to live near it. I have to imagine however the final design would have been more pleasing, but it's definitely quite odd, and probably a bit too dramatic. This design shares the curve of what was actually chosen, except the brown and the design reminds me of those low value brown condos you see, and there's a certain 60s style to the whole thing. 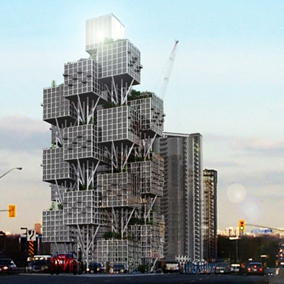 This one is interesting, it has a modern artistic look, though it also partially has a weird futuristic look as well. 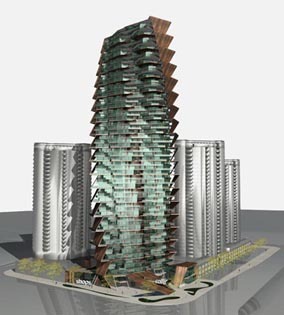 Interestingly the two previous designs share the odd curvature of the Marilyn Monroe condos, where I'd say the Look may have taken more of a precedence than the layout of the actual units people would be living in. There's definitely some oddness here too, though I also wonder how high this building would actually be. Ultimately though I do think they made the right choice in terms of the one that was the most landmarky, which I think was the goal of the competition. But it's interesting to look back at what could have been. The buildings have added value to the whole of Mississauga and are rather pleasant to look at as well. And if you are wondering what is next for Mississauga, the mass transit that is coming and the huge changes likely to happen in Cooksville that have a good chance to make it the new downtown of Mississauga are on the horizon. This is a great city that's just going to keep getting better and better.